As both comments have implications for church growth I thought I would explore them with the help of some system dynamics. Note that the Rick Warren comment refers to liberal theology, but the Russell Moore comment refers to liberal churches. The two concepts are related but not identical. For now though I will define a liberal church as one with a liberal theology, realising that this is not the whole story. A liberal theology refers to a method of arriving at truth which uses scripture as a general, and non-exclusive, guide rather than as a set of propositions that must be believed. Thus rather than scripture indicating a fixed canon of belief for all time, its truths may be modified according to the age. Unlike orthodoxy the bias of the human authors of scripture can be questioned, and even the text itself. Material from outside the Bible, such as history and tradition, may have equal value in determining truth, all weighed by human reason. Thus in a liberal church there is never a fixed set of beliefs. Such a church will be lenient over what it considers the faith, and would expect diversity within its midst. Now I suspect that this definition does not do justice to the use of the word “liberal” by many people, including Christians who call themselves liberal. There are degrees of liberalism, and some may emphasise liberalism in behaviour more than that of doctrine, and vice versa. But hopefully this is sufficient to examine the church growth implications of the Warren and Moore quotes, and expand them a bit. By contrast a conservative church holds to a conservative theology which is fixed by scripture alone for all time. Thus a conservative church will (or should) be strict over what it considers the faith. Where Do Liberal Churches Come From? Both Warren and Moore indicate that liberal churches are inherently weak; they hasten church decline (Warren), and they are unable to start new churches (Moore). The fact remains that although the denominations that are dominated by liberal beliefs are declining the fastest, and have been since Dean Kelley’s  study from the 1970s, they do not decline that fast. So why are there still liberal churches? Why do they survive, and in some cases thrive? One reason church leaders liberalise is that the seminary system encourages liberal beliefs in church leaders. I think that is what Rick Warren was getting at when he said, “it only survives due to tenured academics”. A similar point was made by sociologist Rodney Stark, who in a book review, suggested European churches suffered from “institutionalised clerical atheism” , i.e. the institution of the church encourages doubt in its ministers. My suggestion is that this is aided in part by the seminary/ theological college system of training, the institution that affects the belief system of those it trains. Thus in this scenario those who are called into full time ministry are sent away to a college, where they learn theology at the hands of academics with liberal beliefs. They are then sent to conservative congregations and spend their ministry trying to change their people’s views with the “latest scholarship” they picked up at seminary. One potential result of the liberal ministry is that those who are conservative in the congregation leave and go elsewhere. The church in which I was initially raised is an example of this. In common with many Welsh Presbyterian churches it was rooted in the conservative evangelical theology of the 18th century revivals. When the 1960s started a liberal minister came, who taught people to doubt the orthodoxy they had received. In ten years the church emptied from a few hundred to only a handful of members, as people left and found other conservative churches. After another decade the church was closed. This was repeated across the UK, so for a while the number of liberal churches grew, but not all their people were liberal. As such the number of members in liberal churches declined, firstly through transfer then through death, lack of young people and inadequate conversion. Figure 1 expresses these ideas. The more people in church the more become leaders, the more liberalise and the more liberal teaching injected back into church. This teaching reduces conversion, reduces the number of children of church members who progress to membership, and increases, after some delay, the number who leave the churches so affected. All the loops are balancing loops sending the church numbers to zero. A second result of a liberal ministry is that the most academic of the liberal ministers have such a difficult time in churches that they find a better role for themselves back in the academic environment. Thus they return to seminary as educators and the cycle of the seminary liberalising the next generation of ministers is complete. This is captured in the reinforcing loop of figure 2. 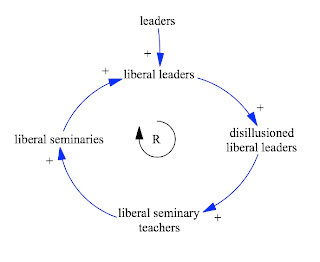 The reinforcing nature of the loop suggests that the process of liberalising accelerates, and combined with figure 1 church decline accelerates. The conservative churches that survive are strong and have a healthy membership. They send the larger numbers to seminary, but some of these trainee ministers become liberal and start the decline process again in the next batch of conservative churches to take on liberal ministers. 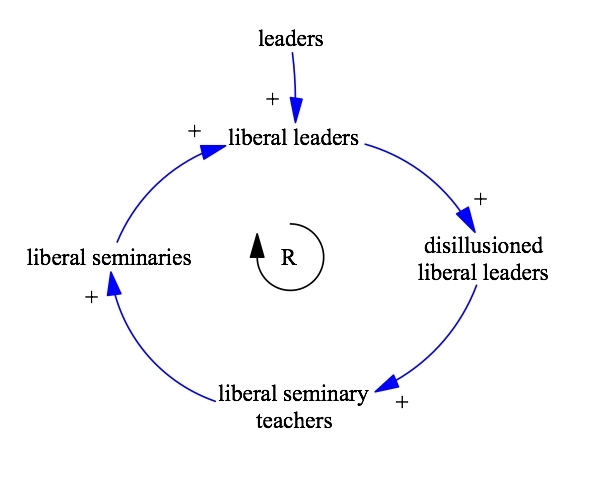 Thus although a given liberal congregation may die in a couple of generations, liberalism, and liberal churches last much longer, fed by the seminary system that changes the beliefs of its conservative intake. I think this has been the canonical evangelical view of the effects of liberalism on the church, and within which the Warren and Moore quotes are set. However I think there are more dynamics taking place than the above scenario suggests. In this scenario the minister is conservative but the congregation is in varying degrees of belief from conservative to liberal. These are not two distinct groups but a spectrum of people from one extreme to the other. Three results spring out. The liberal members leave and join liberal churches. 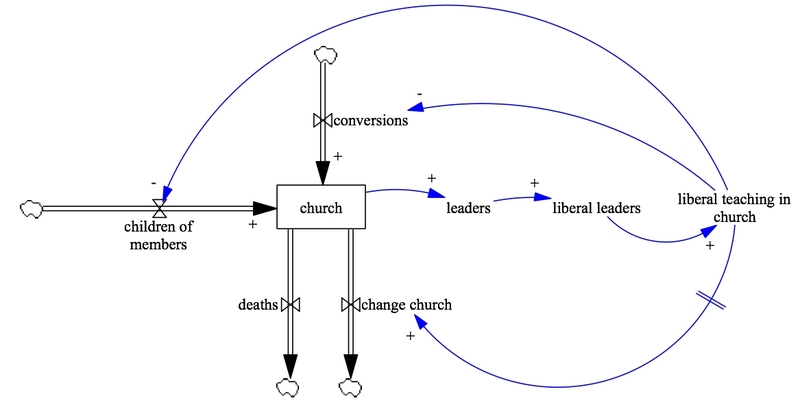 Now at this point I am indebted to a medievalist blogger, Magistra, et Mater , who has used my models to examine the interaction between liberal and conservative churches . Starting with my concept of enthusiasts as the church members who are chiefly responsible for conversion, Magistra suggests that some of them cease to be enthusiasts because they lose enthusiasm for the conservative faith in which they were converted. Thus not only do they become inactive in evangelistic work, they become more liberal as well. There comes a point where such liberal people cannot fit into the church of their conversion, thus they leave and join a liberal church . They are now a specific source of recruitment to the liberal church. These ideas are captured in figure 3, where the conservative church is in red and the liberal one in blue. The enthusiasts recruit from the unbelievers. After a time they cease recruiting and become inactive believers, initially conservative but later becoming liberal. They are still in the conservative church. Eventually the liberal members of the conservative church leave and join a liberal church, figure 3, part A .
I will go further and suggest that there are a number of enthusiasts who get emotionally hurt by their church and also leave. I have noticed a tendency for such hurt people to reject the beliefs of those who hurt them, thus zealous conservative evangelicals abandon that version of the faith, because that was the belief system of the people they fell out with. After some time such hurt people also find a home in a more liberal church. Where beliefs are less strong, there is more tolerance and people are less likely to get hurt, figure 3, part B.
Magistra describes another effect of the recruitment activities of an enthusiastic conservative church, that of negative evangelism. In this case the enthusiasts of the conservative church have a negative impact on unbelievers, turning them from the gospel message. She extends my model to include hardened unbelievers, who are no longer open to the message of the conservative church, figure 3 part C. However if they come across a liberal church, perhaps through the community work of that church, they might find less negative connotations, less demands made, less questions asked, and this is a happier home for their religious quest . Thus I have suggested three sources of recruitment to the liberal church. The result is that rather than dying out, liberal churches can last many generations, albeit at the expense of conservative churches. I am not sure if this is a standard narrative as liberal churches see it. Perhaps someone could comment on this. One side effect of this transfer of liberal people from conservative churches, is that it keeps conservative churches conservative. Strictness in maintaining doctrinal and behavioural standards leads to a strong church, according to Dean Kelley’s definition, which can attract and retain others . Thus the losses of the liberal people from the conservative church may be offset by conversion, and retention of those with conservative views, and net growth of the church could result. Here the issue is not just the interaction between liberal and conservative churches, but the interaction of church with an outside world not part of any church. For a church to grow it needs effective contact with that world. No church can afford to be so irrelevant it cannot get its message across. But the beliefs and practices of the world keep changing, thus there is pressure on the church to keep changing to keep itself relevant. Thus the church over time may change its beliefs in stages, to keep in step with culture, usually 10 to 15 years behind as change comes slowly in the church. Thus there is a slow evolution of practices and beliefs of minister and members alike. For example, evangelical Christians are thought of as the more conservative end of Christianity, there is (in theory) a fixed creed and fixed set of behaviour patterns. However some evangelicals prefer to say they are “conservative evangelical” as they recognise that not all evangelicals are as true to that system of belief as they are. However there are also: "open evangelicals", “progressive evangelicals”, “small ‘e’ evangelicals”, “accepting evangelicals”, to name but a few! Each extra word flags that some aspect of belief, behaviour or attitude has, or could be modified. These are clear signs of a movement that is diversifying, which is another way of saying becoming more liberal. 1) What are the relative effects of the three scenarios? That is, which of the three has the strongest effect on the survival of liberal churches and which has the least, at any given time? 2) Are there other scenarios I have missed? 3) Do the two types of churches actually need each other to survive, as suggested by Magistra ? In other words is there a symbiosis between them that keeps the conservative true, and provides the liberals with new recruits? This blog was originally meant to be a single article, but as ever the material and ideas keep expanding so it is now part one of two blogs, part two to follow. I will finish it by throwing a spanner in the works – I will query the definitions of conservative and liberal! In the 1970s a former Methodist minister turned researcher, the aforementioned Dean Kelley, published a book entitled “Why Conservative Churches are Growing” . Looking at membership data of a range of denominations in the USA he demonstrated that whereas most of the conservative denominations were growing, the liberal ones were in varying stages of decline. As I write this blog it is still generally the case, although some conservative churches, such as the Southern Baptists, are now slowly declining . Again it is against this viewpoint that the comments by Warren and Moore were made. However Kelley was the first to admit the title of his book was confusing [3, p.xvii]. His thesis was not about conservative churches, or growth; it was about strict churches being strong. Strong churches may grow, but there again they may not, depending on the context. Thus a conservative church could be lenient (the opposite of Kelley’s strong) because it does not insist that all its members follow its beliefs or behaviour code, or because it does not direct much effort or zeal into evangelism. Discipline and missionary zeal are two of Kelley’s indicators of strictness. Such a church would be weak, which according to Kelley would include tolerating individualism, a reserve in sharing the faith, and a general lukewarmness for spiritual things. Such a church may be in decline despite its conservative beliefs. By contrast a liberal church may be strict. Yes it tolerates a wide range of beliefs, but it does not tolerate those whose beliefs exclude others. A standard liberal creed is “we are tolerant of everything, except intolerance” . As such there are people who would not fit in such a liberal church, and would have to go elsewhere. All tolerance has bounds! Such a liberal church may be very vocal in proclaiming its stance, not in evangelism, but in campaigning and lobbying non-Christian groups in society. As such there would be considerable zeal for producing opinion change, which could easily result in recruitment. Such a church would be stronger than the conservative one mentioned above, and might well grow more. The issues connected with growth are not just theological as the words “conservative” and “liberal” would imply, but organisational. How strictly does the church keep to its beliefs, ethos, and behavioural norms, whatever they are? The subject will be returned to in a later blog. It has been reproduced on many other websites, and only came to my attention recently. Rick Warren is founder and leader of Saddleback Church in California. Quoted by: Jonathan Merritt, The Rise of the Christian Left in America, The Atlantic, July 25th 2013. Dean Kelley, Why Conservative Churches are Growing: A Study in the Sociology of Religion. Mercer University Press, revised 1986, originally 1972. Rodney Stark, Review of Pentecostalism: The World their Parish. Review of Religious Research, 44(2), P.203, 2002. In the last paragraph he suggests that institutionalised clerical atheism is a barrier to church growth in Europe, and thus a subject worthy of investigation. Magistra prefers to use the labels hard and soft church, rather than conservative and liberal. Hard church, soft church, no church. 24/7/08. http://magistraetmater.blog.co.uk/2008/07/24/hard-church-soft-church-no-church-4494374/ . I will return to these definitions in a later blog. Magistra et Mater: Church growth, negative evangelism and beta churches. 22/4/13. Compare with the model in Magistra et Mater, Hard church, soft church and mission, 26/7/08. John S. Dickerson, The Decline of Evangelical America, The New York Times Sunday Review, 15/12/12. I was once part of a church growth research group that visited a liberal church working in an inner city area. They were the only church in the area. When one of the group asked the minister if any evangelical church had ever tried working in the area, he replied “No, and if they did he would run them out because they would upset the prostitutes and the gays!” The degree of strictness, dare I say intolerance, shocked even the more conservative members of our research group. I think there's one major aspect you've missed: money. I'm thinking of the Church of England (CofE) here, although I believe this is also pertinent to the Church in Wales, and to the major European Lutheran denominations. (The CofE isn't 'liberal' in its entirety, of course, but it is theologically pluralistic, which is a sort of liberalism, I suppose). As a denomination, the CofE (a state church, of course) is old enough and dominant enough to have amassed considerable resources, and it also sees its remit as a national one. As such, it's willing and able to subsidise small congregations in may parts of England. This assistance must be particularly beneficial to the more liberal congregations, since these are usually smaller than the evangelical ones. But apart from assisted church plants, Nonconformist, new or nondenominational churches, even those with growing or relatively large congregations, must be able to pay their bills (which may or may not include the minister's salary) or else they must close. Being evangelical is unlikely to help them if their finances are weak and their structure is institutional. The above thoughts are particularly informed by the work of Robin Gill and Peter Brierley, and by Rodney Stark and co.'s thoughts on supply-side theories of religion, which suggest that state or quasi-state churches tend to sap the energies of smaller denominations while themselves experiencing little urgency to evangelise. The argument is that their continued existence relies above all on their status and their financial security, at least in the medium term. You might also consider the related 'value added' aspect that liberal churches tend to offer. Because liberal/pluralistic denominations tend to be older, wealthier and have more status, they may attract people for whom these aspects are important. This is most obvious in modern Britain in some parents' willingness to attend certain (non-evangelical?) CofE churches to gain access to 'good' church schools. (There are prestigious state Roman Catholic schools of course, but evangelical state academies are rare, and do any of them demand church attendance from their pupils?) In the past, leakage to the more culturally acceptable CofE occurred as Nonconformists moved up the social scale. We also saw the phenomenon of dual church allegiance, with people attending one church to maintain status or affirm cultural norms, and then another more evangelical one for reasons of spiritual upliftment. This seems rare now in the UK. It is true the liberal and mixed denominations have more wealth per member than say independent evangelical ones, due to its inherited resources. Thus subsidies are more likely. However the historic denominations have also inherited some very expensive to maintain church buildings, which newer evangelical churches would not be lumbered with. The situation for mixed historic denominations in the UK is not as rosy as continental Europe as the latter still has the religious tax. The Cof E has not had that for a hundred years, thus the Stark et al thesis on the supply side decline of European Christianity is less applicable to the UK, than the continent. Now the UK is becoming closer to the USA model in the cities – nearly all have a plethora of independent competing congregations. My suspicion is most are competing for the same small and diminishing market and that it is insufficient to halt decline, which is the way things are now heading in the US. Some of the denominations in Wales, which are declining fast, are quite wealthy, partly due to the sale of redundant building. However that finance is hard to turn into ministry as their age profile means there is an insufficient supply of ministers. It is hard to describe denominations like the CofE with liberal/conservative labels. I think this highlights the problems of these labels. I prefer the words soft/hard and to be clear which categories they apply to. Hard in some things, soft in others. Some liberals can be as hard and strict as evangelicals are reputed to be. This is a nice concept to include. In England the CofE has an obvious status. But many others do in their niches. For example in Wales some of the welsh speaking non-conformists have status within the welsh speaking community. I think the issue churches with status face is the community/niche in which they have that status is shrinking, as the general population become less religious. This can be seen in the decline of religion between 2001 and 2011 censuses. As this is largely age-related their niche will be too small for status to help, unless the status is for a resource independent of religion, like education as you mention. I think many of your comments apply because churches have generally relied on tapping natural markets and using their status within them. Effective in times when religion is established, but not ideal for our times. At some point churches need to work out how they can persuade a generally disinterested and hostile population to come to faith. A bit like the first two centuries of Christianity. Thanks for your interesting response to my message!